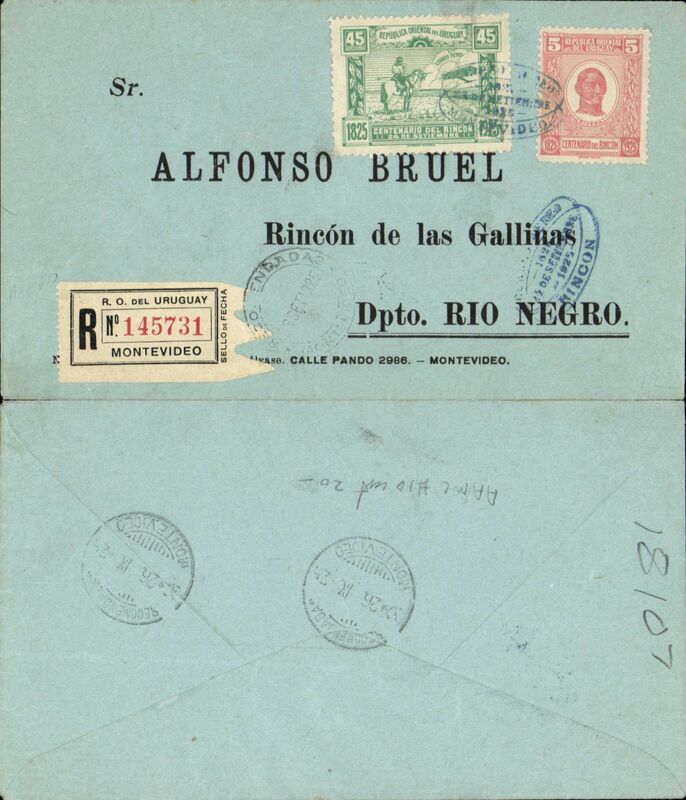 Brunet experimental flight, Montevideo to Mercedes, bs 13/11, plain cover franked 25c brown with red airmail surcharge and 5c ordinary, canc Montevideo double ring cds, typed 'Por Correo Aereo', Muller #4, 3000F. 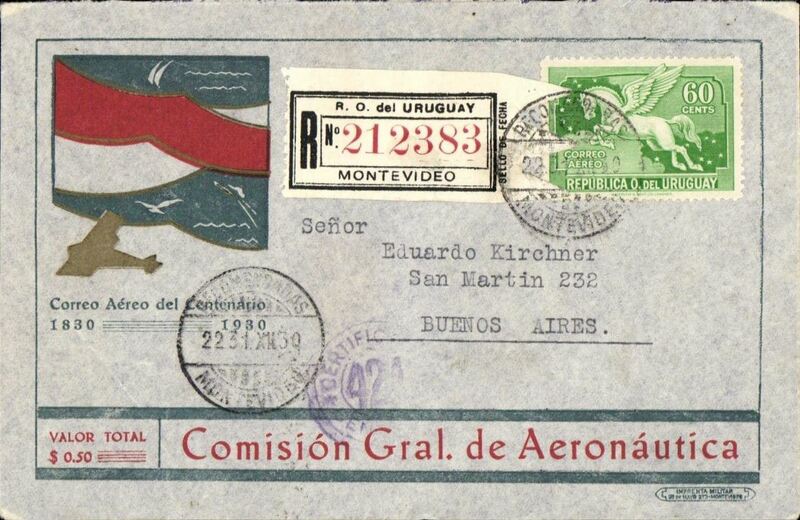 Special flight, Sarandi Grande to Montevideo, bs 12/10, franked 25c brown with green airmail surcharge and 1923 Sarandi set of 3, red framed 'Por Avion' hs, Muller #7. 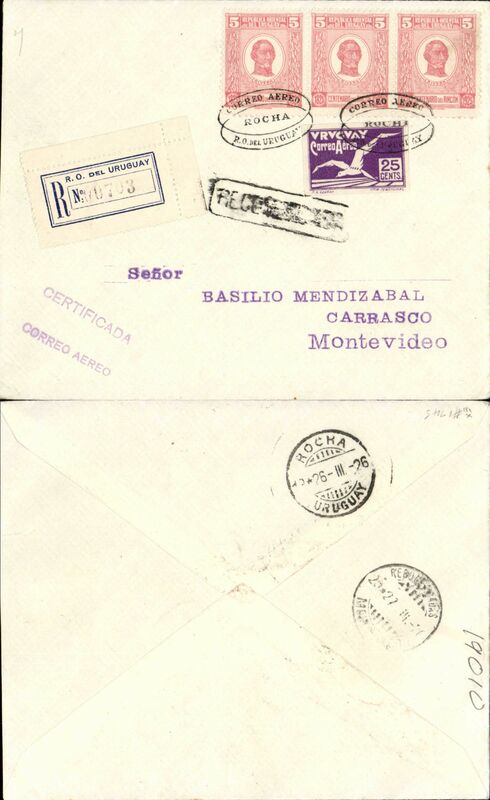 F/F Montevideo to Rincon, franked 50c inc Battle of Rincon 45c only available on cover and for this flight, canc blue oval special FDI postmark, registered (label) cover, bs 26/9, Muller #13. 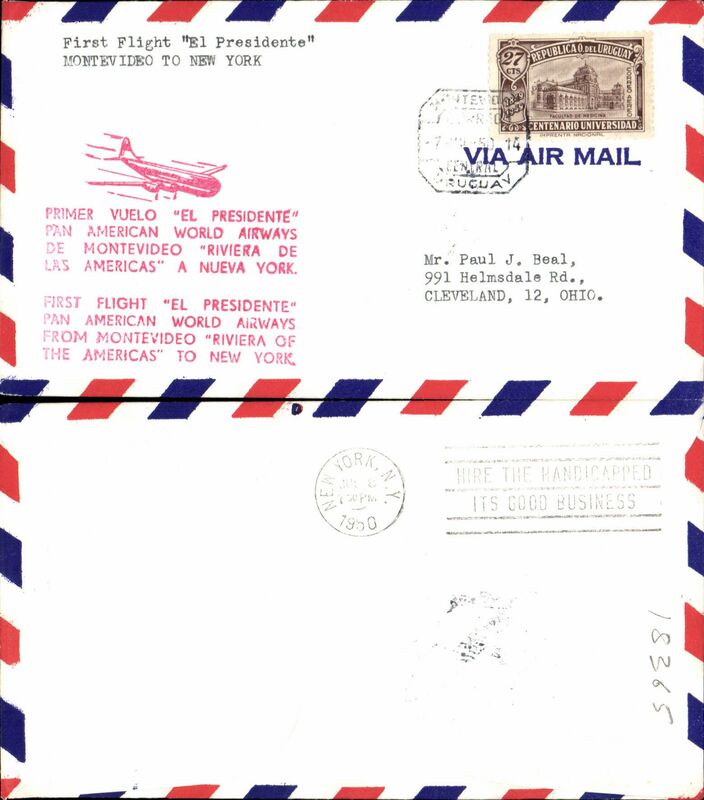 F/F Montevideo to Rincon, franked 50c inc Battle of Rincon 45c only available on cover and for this flight, canc blue oval special FDI postmark, registered (label) cover, Muller #13. 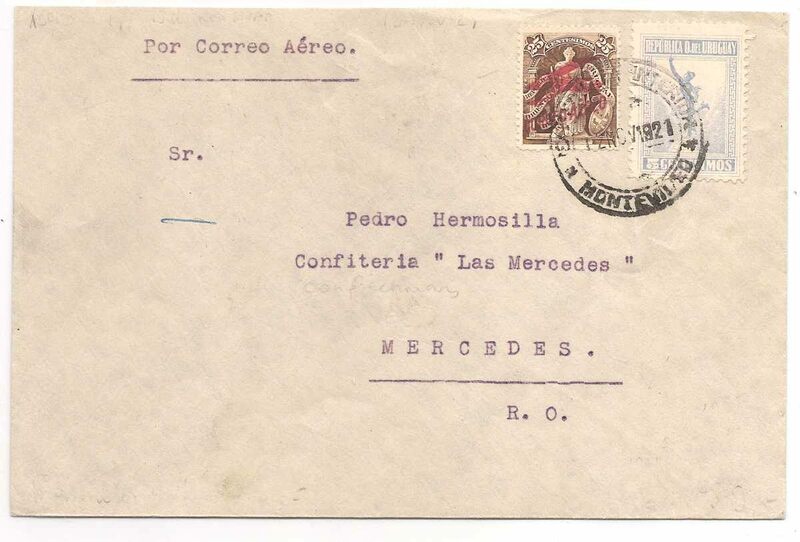 Montevideo to Buenos Aires, bs 10/3, registered (label) airmail cover franked 1926 6c, 10c, & 20c imperf airs + 10c ordinary, canc fine strike large red framed "Servicio Postal Aereo/Montevideo-Buenos Aires" undated cachet, registration label canc Montevideo 10/3 cds. 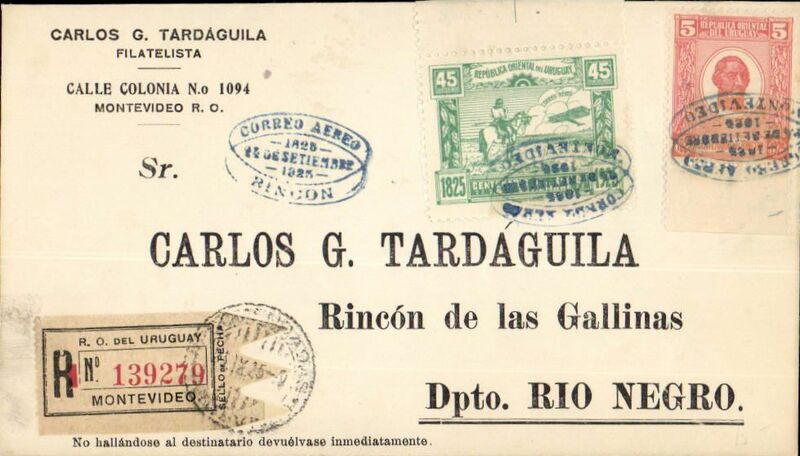 Junkers Sales Mission takes over the Trans Rio de la Plata service, Rocha to Montevideo, bs 27/3, registered (label) cover, franked 30c including the special 25c air stamp issued exclusively for this service, cancelled ornate undated Rocha cachet, violet 'Correo Aerea' hs. Attractive special envelope celebrating the 100th anniversary of Uruguay. 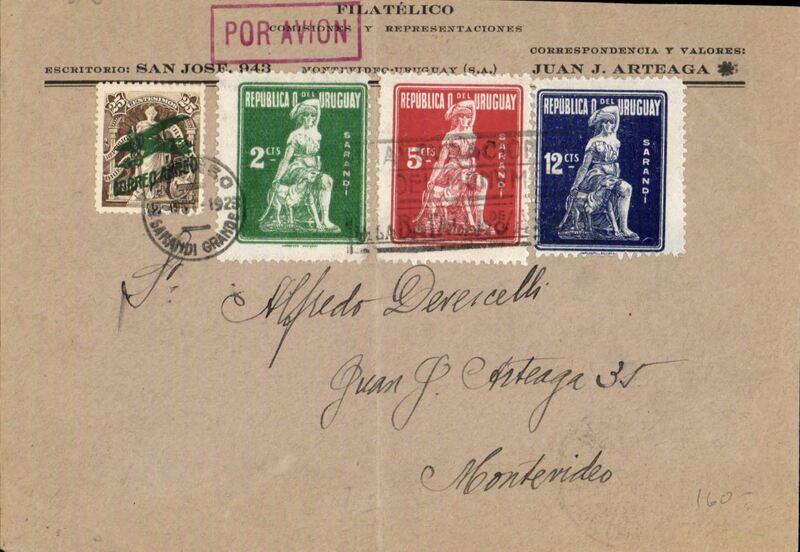 Postmarked Montevideo June 27, 1930 addressed to Hamburg with no arrival b/s but a Paris transit b/s July 9th. Red German hamburg airmail arrival cachet. Rare envelope franked by a centennial stamp. 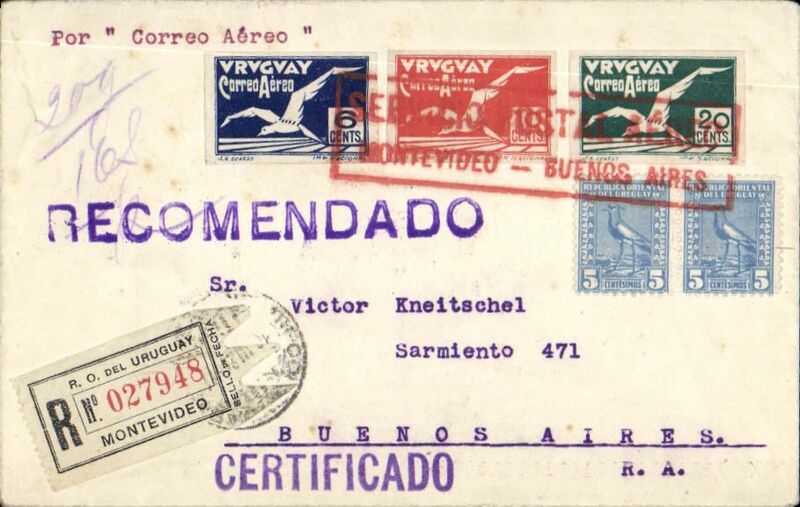 Centennial flight Uruguay-Argentina, Montevideo to Buenoss Aires, bs 1/1/31specially printed red/gold/grey/light grey registered (label) cover franked 60c Sc. 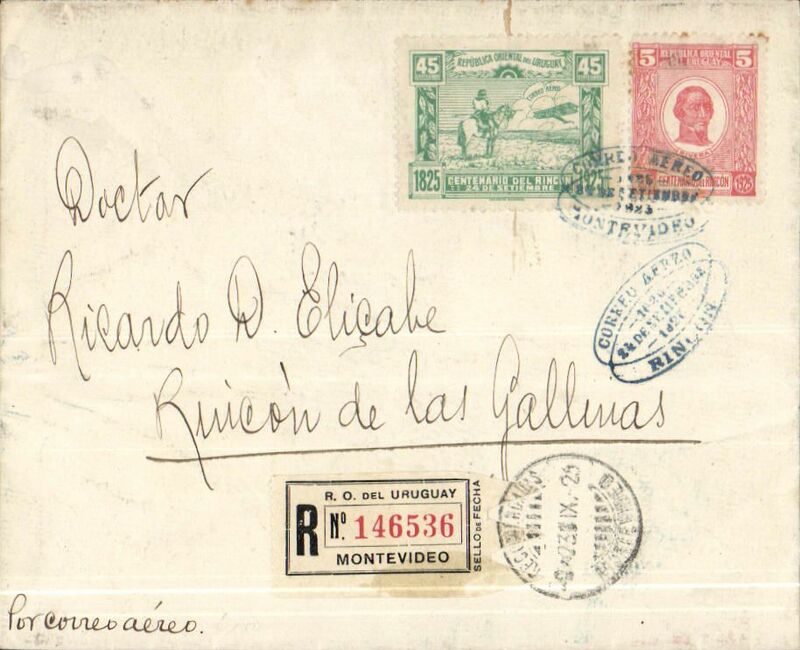 C46, postmarked Montevideo December 31, 1930. This flight which took place on January 1st, 1931 and was commemorating the 100th anniversary of Uruguay. Very attractive envelope, Muller #43. 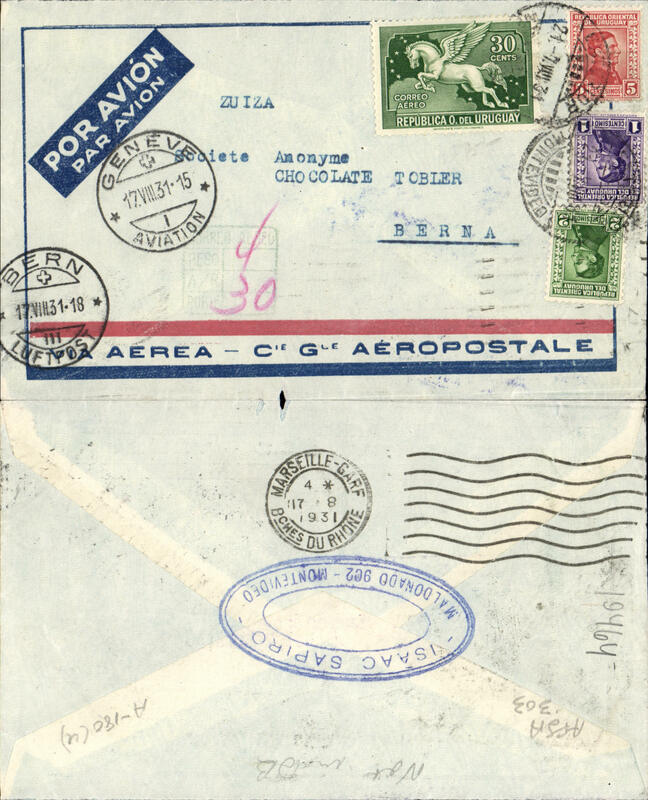 Pre-printed Aeropostale envelope postmarked Montevideo (Uruguay) August 7, 1931 with transit b/s Marseille August 17 and Geneva August 17 and final arrival b/s Bern August 17th. 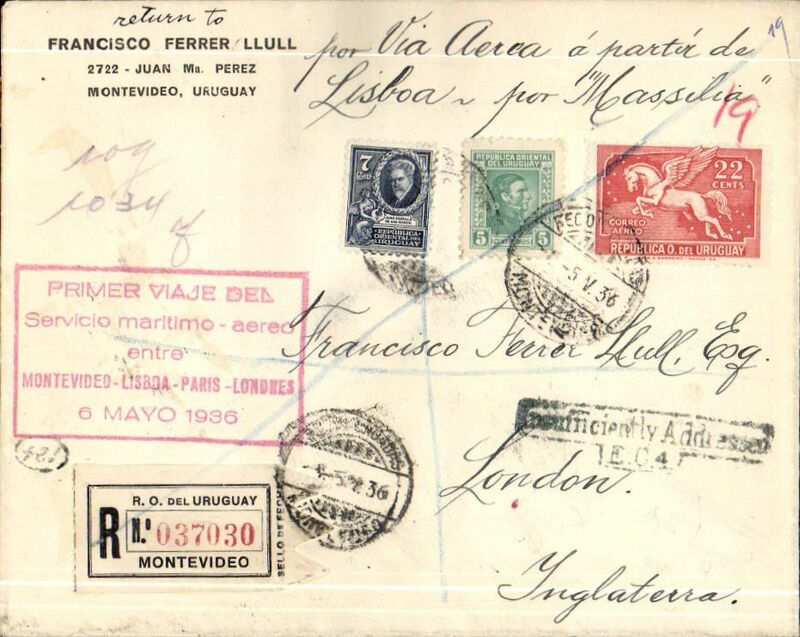 Pre-printed Aeropostale envelope postmarked Montevideo (Uruguay) January 15, 1932 to London (GB) with no arrival b/s but with transit b/s Paris January 24th. Cover postmarked Montevideo (Uruguay) February 19, 1932 addressed to Berlin (Germany) with arrival b/s March 1 and also Paris transit b/s March 1st. 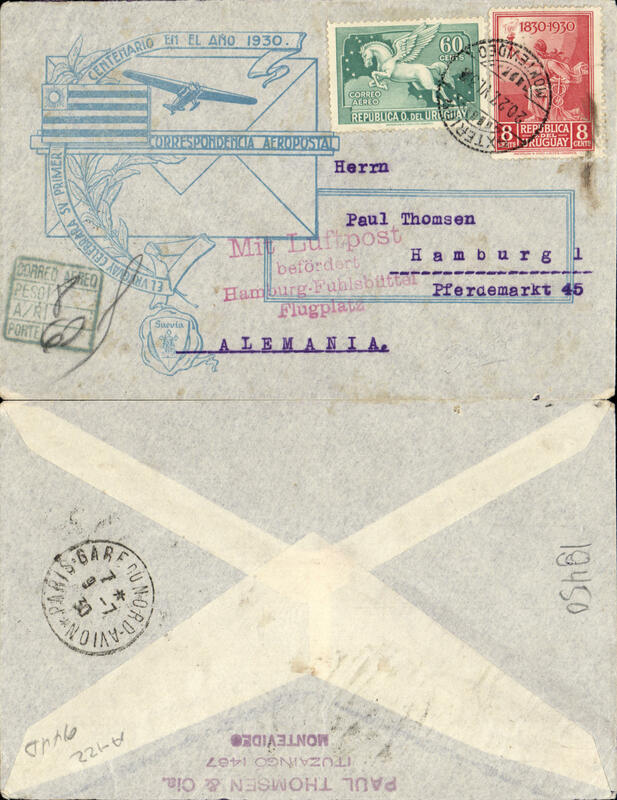 Red airmail receiving stamp applied in Berlin. 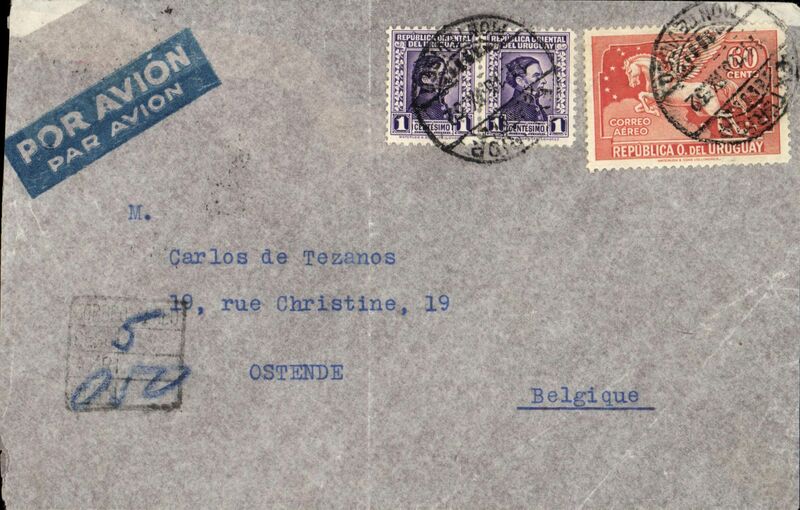 Cover postmarked Montevideo (Uruguay) September 16, 1932 addressed to Ostende (Belgium) with no arrival b/s but with transit Paris b/s September 26th. Belgian mail is not so common. Pre-printed Aeropostale envelope postmarked Montevideo (Uruguay) October 15, 1932 addressed to Bern (Switzerland) with no arrival b/s but with transit Marseille b/s October 23rd, also fine strike black cross Jusqu'a applied in Marseilles. Attractive franking. 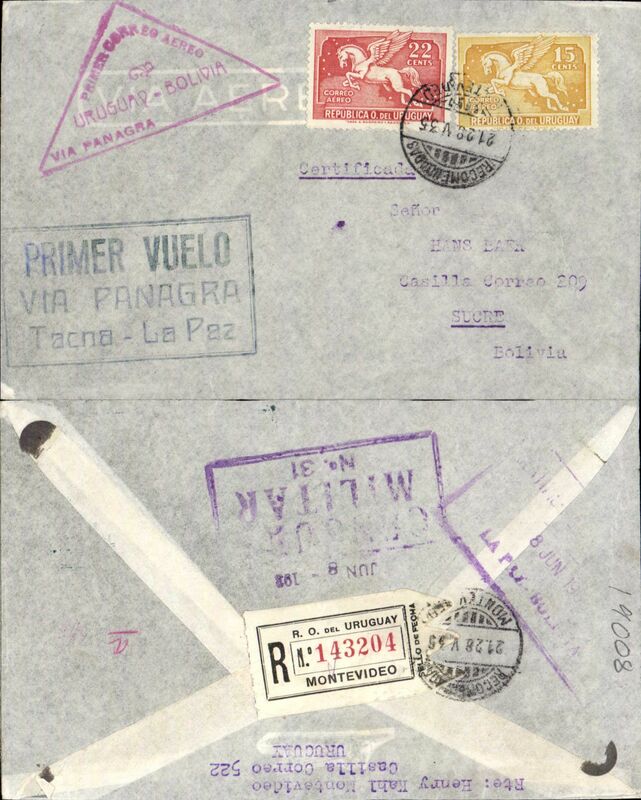 Panagra FAM9, F/F Montevideo to La Paz, bs 5/6, unusual back/buff printed 'Suevia' registered (label) cover, franked 1935 Pegasus 37c canc Montevideo cds, official red triangular Montevideo 'Uruguay-Bolivia' flight cachet, also large red framed 'Primer Vueo/Via Panagra/Tacna-La Paz cachet, and framed violet Chaco War censor mark verso. The Chaco War, fought between Bolivia and Paraguay 1932-1935, was won by Paraguay, but the final peace treaty was not signed until July 1938. 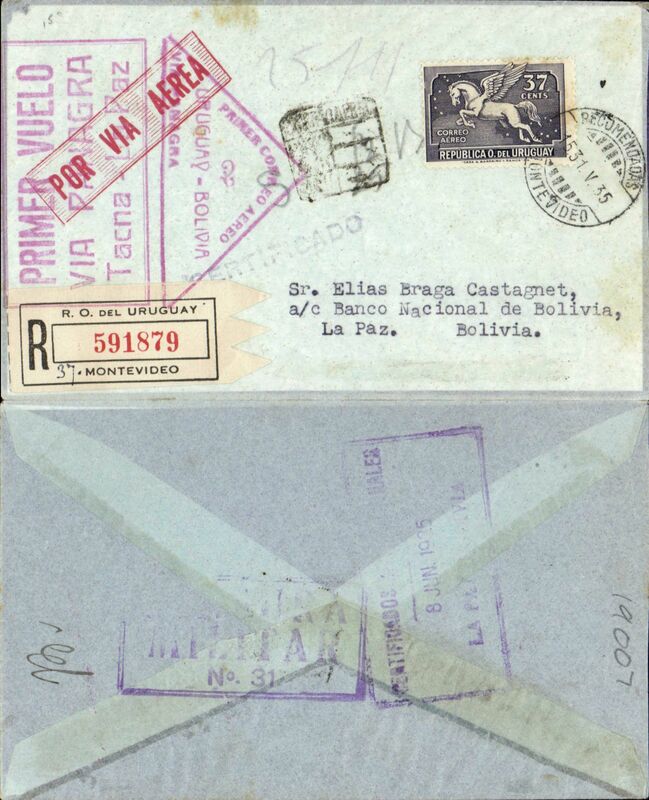 Panagra (FAM 9), 1st regular service Bolivia to Uruguay, Montevideo to La Paz, bs 8/6, registered (label) cover franked 1935 35c, canc Montevideo 31/5 cds, red triangular "Primer Correo Aereo/Uruguay-Bolivia/via Panagra" cachet and red framed "Primer Vuelo/via Panagra/Tacna-La Paz" cachets, also violet framed Chaco War censor hs verso. The Chaco War, fought between Bolivia and Paraguay 1932-1935, was won by Paraguay, but the final peace treaty was not signed until July 1938. 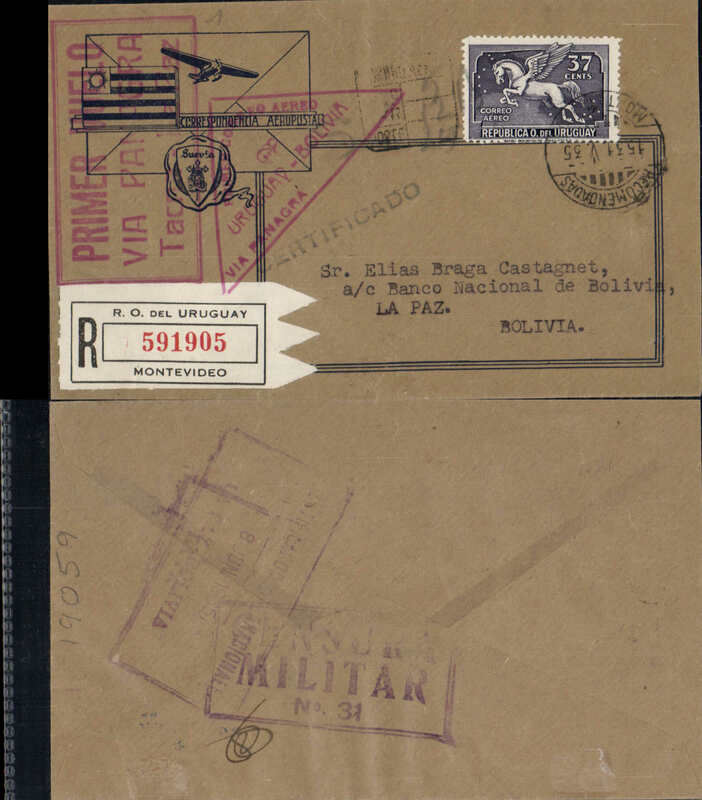 Panagra (FAM 9), 1st regular service Bolivia to Uruguay, Montevideo to La Paz, bs 8/6, registered (label) cover franked 1935 35c, canc Montevideo 28/5 cds, red triangular "Primer Correo Aereo/Uruguay-Bolivia/via Panagra" cachet and black framed "Primer Vuelo/via Panagra/Tacna-La Paz" cachets, also violet framed Chaco War censor hs verso. The Chaco War, fought between Bolivia and Paraguay 1932-1935, was won by Paraguay, but the final peace treaty was not signed until July 1938. 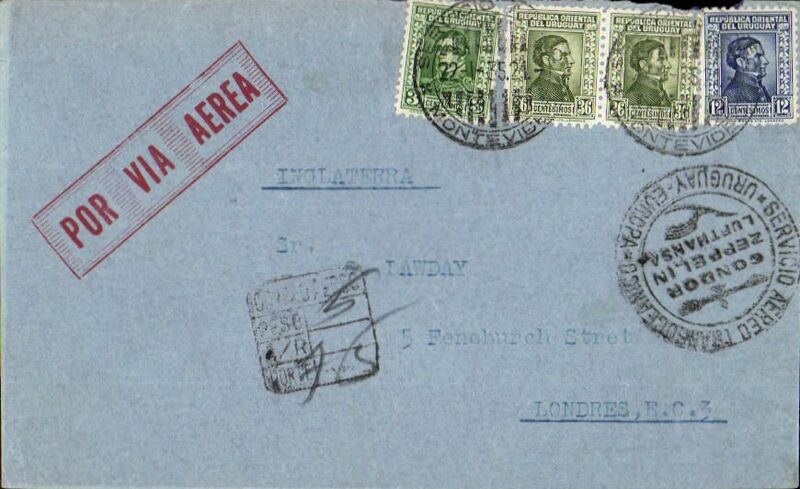 First North Atlantic sea-air service, Montevideo to London, no arrival ds, Uruguay to England, carried on the first North Atlantic sea-air service, Montevideo to London, registered (label) cover, franked 34c, canc 'Recomendata/Montevideo 5/5/36 cds, and verso Montevideo 15/5/36 cds tied by red/white "Servicio Postergado" (delayed) sticker, fine strike red framed "Primer Viaje Del/Servicio maritimo-aereo/entre/Montevideo-Lisboa-Paris-/Londres/ 6 Mayo 1936" flight cachet, ms 'Por Via Aerea a partir de Lisboa por Massilia'. Carried by the paquebot Massilia (Compagnie de Navigation Sud-Atlantique) from Montevideo-Lisbon, then flown to London via Paris. Le Massilia was a cruise line Compagnie de Navigation Sud-Atlantique, launched in 1914. Cover sent from Montevideo (Uruguay) postmarked June 21, 1936 to Naples (Italy) with arrival b/s June 29 and Marseille gare avion b/s of June 28, black framed Marseilles double line Jusqu'a. Although the weekly 100% air service was inaugurated in January 1936, a shortage of planes prevented from offering a regular weekly service at least for the first few months of that year. 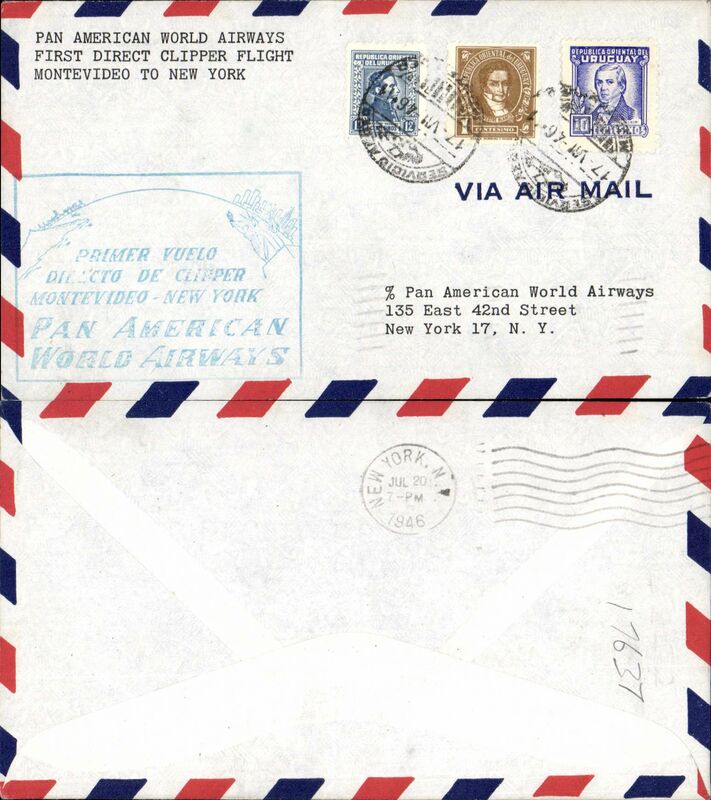 Return flights occurred on June 17 and June 29 so this cover, mailed between those flights, was sent by the old-fashion air-sea service which was still in operation to supplement the full-air service. Condor company envelope. 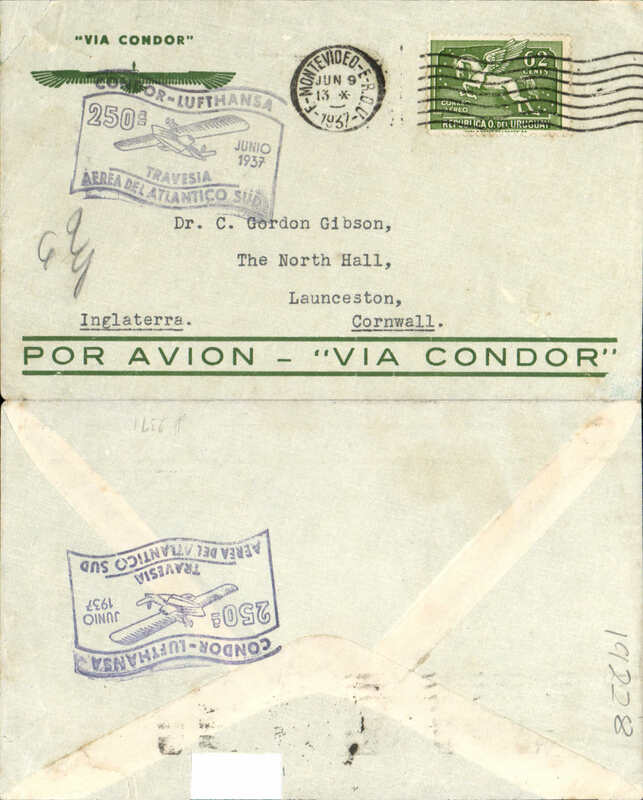 250th South Atlantic crossing, Condor/Lufthansa, Montevideo to England, no arrival ds, flown across the South Atlantic to Europe, black 'flag' flight cachet, dark blue/grey 'Par Avion - Via Condor' company cover with winged Condor logo franked 12c postage + 50c airmail. Uncommon from Uruguay. 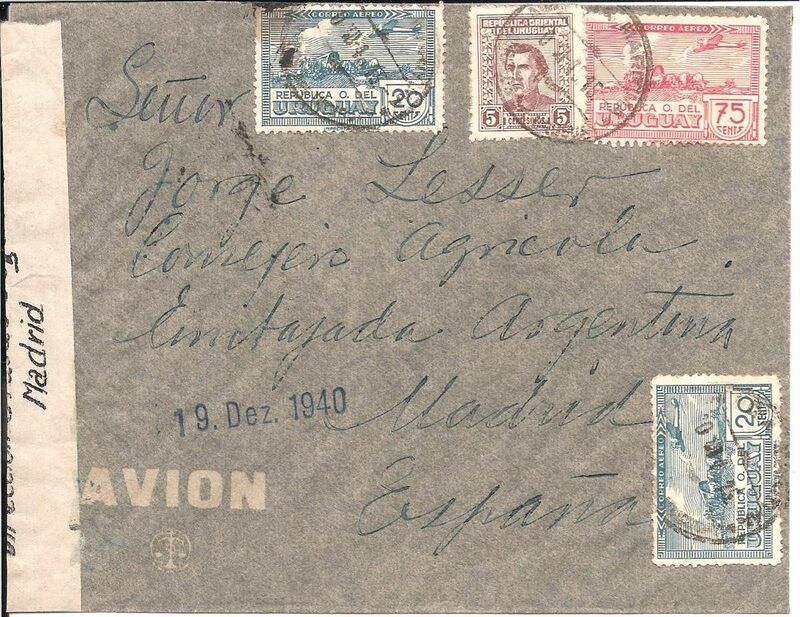 Uruguay to Spain, flown by LATI, Montevideo to Madrid, 19 Dez 1949 arrival hs on front, franked 1P 20c, sealed black/white' Direction Gialdo Securidad/Madrid' censor tape. Pan Am southern trans Atlantic flights bypassed the UK Bermuda censor only between March and September 1940, so not flown by Pan Am, nor by the Air France South Atlantic service which ceased in July 1940. Flown Montevideo-Buenos Aires-Rio de Janeiro by Condor, then by LATI all the way to Seville, thus avoiding the British censorship on the Pan Am North Atlantic service. 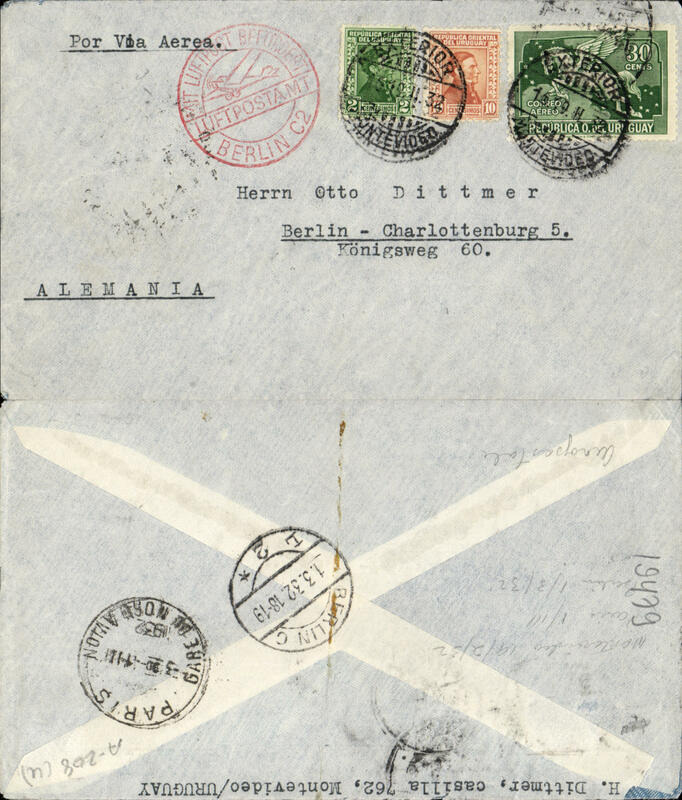 Mail carried by LATI, DLH and Ala Littoria was not always censored in Spain. 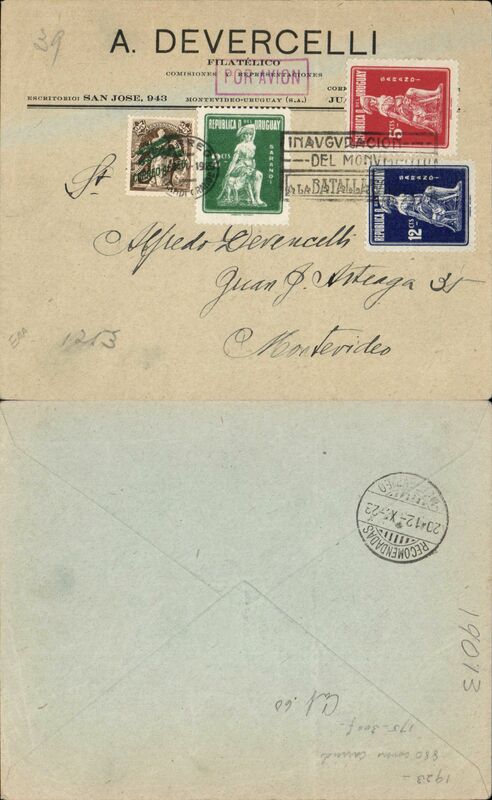 LATI mail from Uruguay to Spain is uncommon. 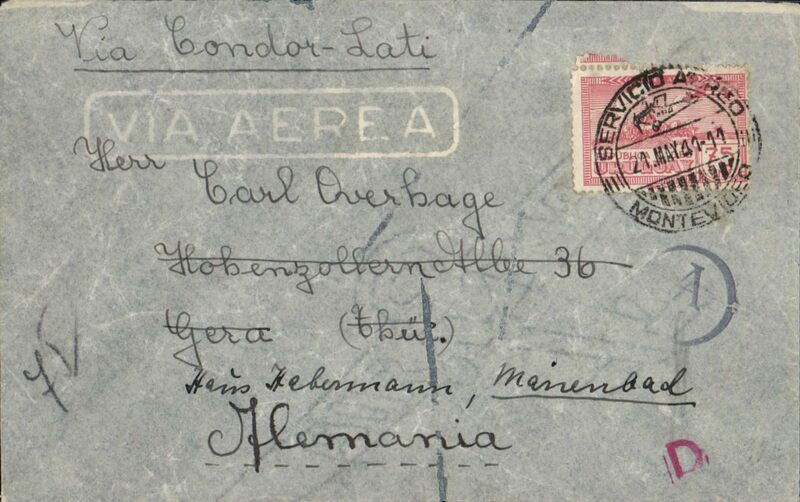 Uruguay to Germany, scarce LATI censored WWII commercial airmail cover, Montevideo to Marienbad, franked 75c, canc Servcio Aereo/Montevideo 21 May 41, ms "Via Condor-LATI", black German "A" in circle censor mark on front indicating cover examined but not opened. Flown Montevideo-Buenos Aires-Rio de Janero by Condor, then by LATI all the way to Rome, thus avoiding the British censorship on the Pan Am North Atlantic service. The Air France South Atlantic service ceased in July 1940. 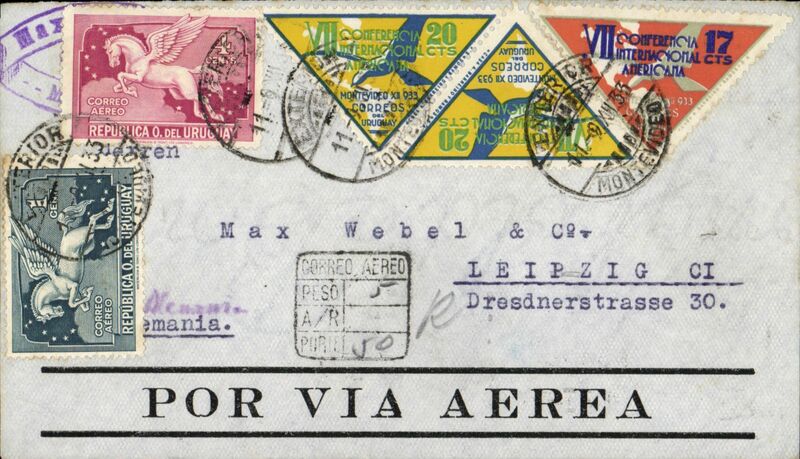 A scarce cover which also illustrates the importance of the 'date of dispatch' in helping to decide if Air France or LATI is the carrier of 75c franked Uruguay-Europe airmail. Small flap tear verso. 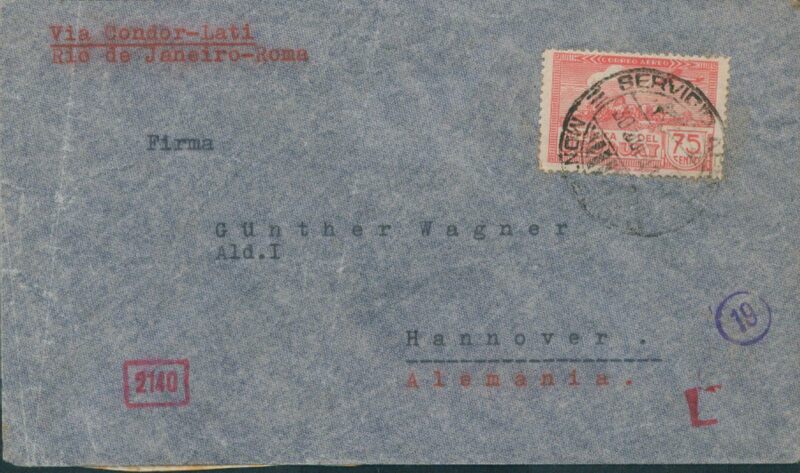 Uruguay to Germany, scarce censored WWII commercial airmail cover, Montevideo to Hannover, franked 75c, canc Servcio Aereo/Montevideo 3 JUL 41, typed "Via Condor-LATI/Rio de Janero-Roma", sealed German black/white OKW censor seal code d (Munich), also 19 in circle additional German censor mark. Pan Am southern trans Atlantic flights bypassed the UK Bermuda censor only between March and September 1940, so not flown by Pan Am. Flown Montevideo-Buenos Aires-Rio de Janero by Condor, then by LATI all the way to Rome, thus avoiding the British censorship on the Pan Am North Atlantic service. 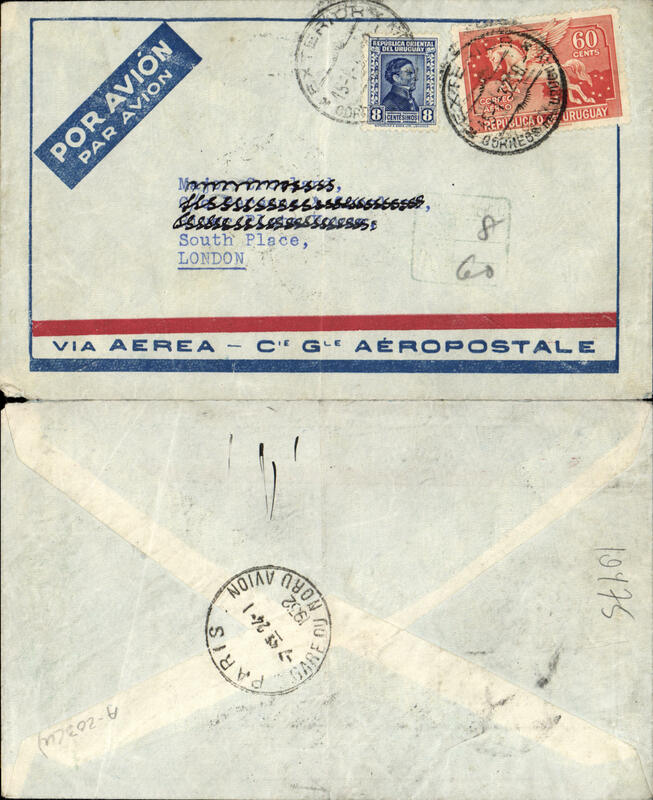 A scarce cover which also illustrates the importance of the 'date of dispatch' in helping to decide if Air France or LATI is the carrier of a 75c franked Uruguay-Europe airmail. 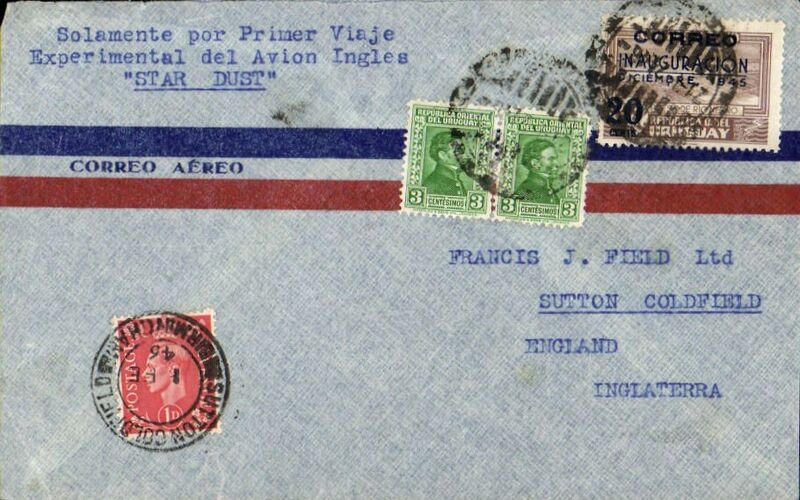 British South American Airways, first BSAA mail from Uruguay, Montevideo to London, 1/2 arrival ds on front, airmail cover franked 26c, typed 'Solamentte por Primer Vaje/Experimental del Avion Ingles/"Star Dust"'. This cover is Illustrated on p23 Beith R. Star Dust was a British South American Airways (BSAA) Avro Lancastrian airliner which later disappeared in mysterious circumstances on 2 August 1947 during a flight from Buenos Aires, Argentina to Santiago, Chile. In the late 1990s, pieces of wreckage from the missing aircraft began to emerge from glacial ice in the Andes mountains near Santiago.